Last week Sargasso had procured a dataset of interruptions from politicians in our House of Representatives. With the counts from which politician had interrupted which in debates they had made some nice infographics and a couple of blog posts. 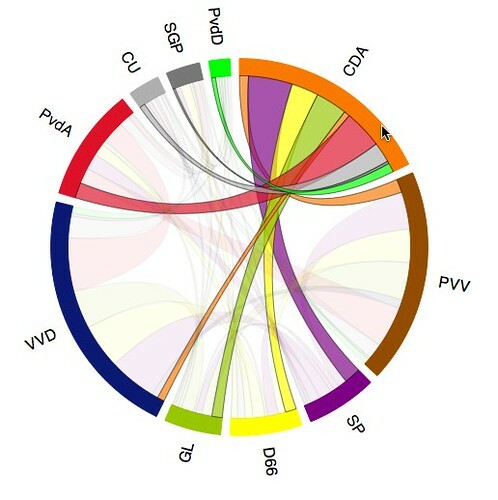 I thought this was the ideal opportunity to put all of the data (aggregated by party) in the D3 example chord diagram. This was featured on Sargasso the next day. The graphic is not directly clear, but the data is deep and interesting enough to afford some exploration and it yields insight into the behaviours of various political parties during the reign of this cabinet. And what seems to matter a lot to people: it looks quite pretty. With regard to D3, I think I will use it more often. It works quite similar to Protovis with which we have done some stuff before, but it feels much more current. Protovis itself is discontinued in favor of D3 according to a notice on the site and D3 seems a very worth successor.